A red-bellied woodpecker in a tree. 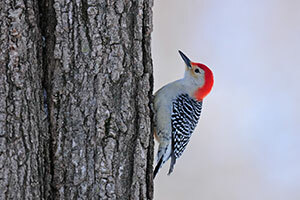 The red-bellied woodpecker may be one of the loudest species of birds that can be found in the Florida Everglades today. Like many of the species that can be found within the woodpecker family, this tiny, yet beautiful bird, was given the name “woodpecker” for a reason. They are true professionals when it comes to drilling holes into wood, utilizing their strong beaks in this way for purposes ranging from foraging for food to leaving warning messages outside of their dens. The name of the red-bellied woodpecker, however, is quite misleading, as it is not the belly of this species of woodpecker that is red at all, but the cap of its head. Unfortunately, the name “red-headed woodpecker” was already taken by a close relative in the woodpecker family, so the red-bellied woodpecker had to settle for something slightly less descriptive. They are quite attractive birds, however, with gray or tan feathers on their faces and bellies and white and black barred patterns on their wings. They are also quite petite birds, only reaching lengths of about 10 inches and with wingspans no more than 18 inches long. Like most, if not all woodpecker species, the red-bellied woodpecker is most known by its loud vocalizations and drumming behaviors. Both males and females will both call and drum, communicating with others of their species who are nearby. Males, however, do have a tendency to drum more than females, and this behavior is often associated with the attraction of a mate. These intense vocalizations start almost at birth for these woodpeckers, as babies will call for food from their parents when they are just fledglings. When feeding, a red-bellied woodpecker will use its incredibly strong beak as a powerful tool, either probing into cracks in the wood or drilling its own holes when no cracks exist. Once food has been located, the woodpecker will use its long tongue to pull it out, usually feeding on either small insects or food previously stored by other animals deep within the wood. Like many other birds, red-bellied woodpeckers will then exhibit foraging behavior themselves by later storing this food in their own private locations. Red-bellied woodpeckers also depend on dead and decaying wood for other reasons, such as for nesting, breeding, and shelter from potential predators. Because they are so small, they have many potential predators in the Everglades and surrounding suburban areas, such as hawks, owls, snakes, other species of woodpeckers, and even house cats. However, despite their small size, red-bellied woodpeckers are known to be quite territorial and fiercely protective over their nests, and will get aggressive with predators many times their size when watching out for their young. While fewer red-bellied woodpeckers are being seen in southern Florida theses days, they can still be spotted occasionally by birdwatchers in the Everglades and by families on Everglades airboat tours. In fact, this is one bird species that can be found on an Everglades swamp tour that you’ll likely hear coming before you see it! Can an Animal’s Diet Affect Its Coloring? How Do Hurricanes Affect Florida Wildlife? Next story How Do Hurricanes Affect Florida Wildlife?